Online Retailers That Violate Manufacturers (MAP) Minimum Advertised Price Agreements. What is a (MAP) Price? Minimum Advertised Price relates only to the “ADVERTISED” price and is an absolutely legal practice under U.S. antitrust statutes. 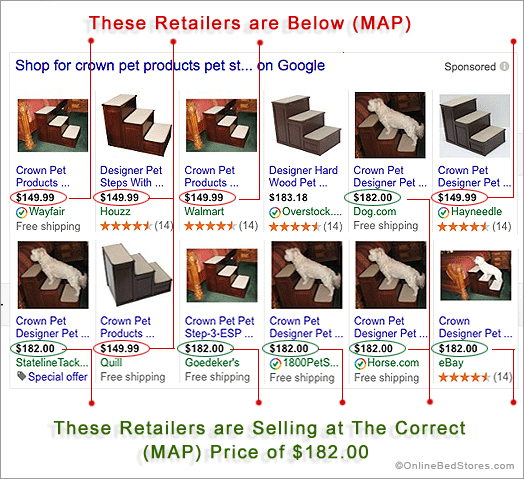 Essentially, a retailer is limited to advertising MAP protected products at a predetermined price. A retailer is free to sell a (MAP) protected product, at any price they wish, as long the advertised price is above the MAP Minimum Advertised Price, that price is often guided by the MSRP Manufacturer’s Suggested Retail Price. Manufacturers and or suppliers are being hurt as a result of online retailers breaking their (MAP) Minimum Advertised Price agreements. This is when an online retailer will list a product for retail below the Manufacturers established pricing. Unfortunately a number of large and small online retailers participate in this unethical practice in an effort to capture more sales. This practice is at the expense of the Manufacturer and honest retailers who follow the rules. Why is maintaining a MAP price so important to Manufacturers and ultimately consumers? Let’s say for example when prices are set under a (MAP) policy, authorized retailers know in advance what their profit margins are on a particular product. The retailer can then determine the amount that can be spent on search advertising to create awareness that a given product exists, when consumers shop online. For example if a product cost the retailer $50.00 and the MAP is $100.00 the profit margin before advertising, credit card fees etc. would be a $50.00 profit. EXAMPLE: in the above screen shot 12/6/2016 you can clearly see that Wayfair, houzz, Wayfair’s listing on Walmart market place, Hayneedle and Quill are all violating this manufacturers “Crown Pet Products” (MAP) policy. If a retailer breaks (MAP) and sells the product at $90.00, $10.00 below the MAP Price using the same example the profit would be $28.00, which is roughly a 31% profit margin. When profits fall due to honest retailers that abide by the MAP price the retailer may loose sales to a retailer violating the MAP price because the customer vies for the cheaper price, a retailer’s willingness to continue to sell and advertise up against a retailer that is breaking (MAP) on a product falls, resulting in a smaller number of retailers advertising and selling the product. Keep in mind listing a product by brand name on a large online market place is not the same thing as “generic advertising”, the promotion of a particular product without reference to a specific brand name or manufacturer. An ethical retailer abiding by a manufacturers (MAP) agreement typically will not break MAP just because another retailer does. It was found, through our investigation, that some of the larger retailers, like Amazon and Wayfair feel that if a competitor is in violation of MAP it is permissible for them to match that lower price. It is our opinion at OBS, that two wrongs do not make a right. Unfortunately in today’s e-commerce landscape, dominated by 3rd party marketplaces like amazon, jet.com, houzz and Walmart market place to mention a few, some profit margins are are as low as 10% as in the above example of the pet steps. Some retailers are using these good quality products as lost leaders, in other words selling at break even pricing or at a loss in an effort to capture the sale to meet their goal of number of customers instead of “profit” to keep investors happy, to ensure additional funding. Many of these market places are bleeding cash and need to do what they can to show investors that they have customers and projection of profits. For the Manufacturer this is very risky to have only a handful of retailers selling their product. It has been a practice for Amazon to sell a product at such a small profit margin, with the intention to eliminate competition, and then to negotiate with the manufacturer for a lower wholesale price. With wholesale prices already at rock bottom this is the perfect formula to force a manufacturer to go out of business, for with significantly reduced wholesale prices, the Manufacturer, may not be able to meet all operating and manufacturing costs. As the saying goes, don’t put all your eggs in one basket. In conclusion, both retailers and consumers must become more aware of the realities of today’s e-commerce, if we want more product choices, better quality products and better customer service in terms of product knowledge, we need to support the smaller honest retailers that support the smaller higher quality manufacturers. Remember the cheapest price may end up costing the most.